Record numbers of potentially dangerous Portuguese man-of-war jellyfish have been found on the South West coast for the second year in a row. At least 14 creatures have so far been washed up in Dorset, Devon, Cornwall and the Isle of Wight. The Marine Conservation Society (MCS) said "unusually large" numbers of man-of-wars had been found, which it put down to the recent strong winds. People are being urged not to touch the jellyfish which can give a nasty sting. The man-of-wars (physalia physalis), which are also known as bluebottles, usually live in tropical waters far out in the open sea. 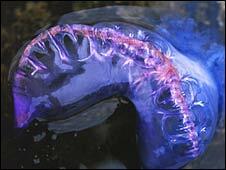 Also know as blue bottle - not a true jellyfish but single animal made up of a colony of organisms, known as a siphonophore. Float, or airbag, can look like sail of 16th century Portuguese warship, hence the name. Airbag is about 30cm (12 inches) long, 12.7cm (five inches) wide and acts as sail. Tentacles can reach 50m (165ft) long. Sting not usually fatal but extremely painful. Favoured habitats are warm seas off Florida Keys, Atlantic coast, Gulf of Mexico, Indian Ocean, Caribbean and Pacific. But strong winds have been blowing them in to the shores of the South West and experts said more were expected. Three have been found in Kimmeridge Bay, Burton Bradstock and Durdle Door in Dorset, one near Holcombe, in Devon, and one on the Isle of Wight in the past week. Peter Richardson, from the MCS, said since mid-July, the charity had received at least another 10 reported sightings. He said: "There will be more than that out there. That's just the ones that are being reported to us." 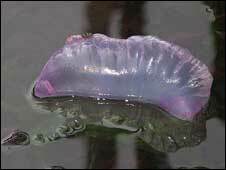 Mr Richardson said that between 2003 and 2006 only five Portuguese man-of-wars were found on UK shores, mainly in the South West. But last summer that rose to 10. "Last year we started getting more reports, so two years in a row now we've had unusually large numbers of man-of-wars reported," Mr Richardson said. "We are expecting more to wash up. As long as the wind prevails, they will keep coming." The MCS has not had any reports of anybody being stung in the UK but Mr Richardson urged beach-goers to be careful as they had a painful sting. "The jellyfish look very pretty and the danger is if a child picks one up to show his mum he could have a nasty sting. "There are records of some fatalities. You're not guaranteed to die but some people go into anaphylactic shock. "Some people have been finding them and reporting it to lifeguards, who have picked them up and taken them away." A man-of-war is made up of a colony of creatures to form one jellyfish. The long tentacles can grow up to 165ft (50m) and hang from a balloon-like float resting on the surface. Man-of-war colonies are usually found in the Florida Keys and off the Atlantic coast, the Gulf Stream, the Gulf of Mexico, the Indian Ocean and the Caribbean.